Leading philanthropy consultant Katherine Fulton's November 2006 talk at the LongNow was interesting and informative but unfortunately ignored the Accountability 2.0 and Effectiveness 2.0 that should be accompanying Philanthropy 2.0. It becomes increasingly clear that the roadblocks are more about political, structural, procedural, institutional and organizational issues than the receipt of funds. As Amy Chua points out in "World on Fire," there is no incentive for ruling elites to take any action to diminish their power. Philanthropy 2.0 should be about the effective usage of financial and other resources not simply their presence. Peer-to-peer finance is the Markets 2.0 improvement - a more direct way of allocating philanthropic resources, using services such as third-world entrepreneur lender Kiva, international grassroots project donation site GlobalGiving and livestock donation service Heifer. Even better than personally-directed philanthropic capital is moving into an active role by being a volunteer tourist, voluntouring for two or more weeks in a country of your choice with programs run by UniversalGiving, Social Venture Partners and other organizations. A nice antidote to regular travel, adventure travel, extreme travel and eco-travel. With the proliferation of Web 2.0 companies, website based applications for category aggregation are needed. The idea would be one site each for MetaCalendar, MetaPhoto, MetaBookmarking, MetaShopping (some of these exist but a more robust UPC code data aggregation and information packaging tool), MetaSocialNetworking (aggregating multiple in-site irresolvable profiles in addition to aggregating across all social networking sites), etc. Advances and acceptance of federated identity are in process, however, user-administered affinity profiles could sidestep and even pave the way for federated identity and single logins. Being useful is a parameter that should be pushed to the web object level, not imposed on the human user. Objects can become semi self-aware, at minimum finding and knowing of all other web instances of themselves (initially via UPCs) and the parameters there from such as price and availability, and later higher level parameters such as affinity compatibility. 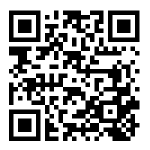 All web content objects (products, services, blog posts, news items, personal profiles, etc.) could become self-aware in the sense of interfacing with affinity profiles and gathering and proffering basic and extended information and recommendations to human users. Conceptually, there are many possible way for technology to re-invent the future of professional sports event viewing and fantasy league sports participation. The growing multitude of professional and amateur video and photo footage of professional athletic events from every angle and time frame could be used to allow user-directed event watching. For example, in a football game, some viewers want to see the whole field view, some just the 10 yards of current action. Some viewers want to see certain replays from certain angles, some don't. Some viewers wish to see the content at varying levels, e.g. ; instructional and coaching viewers want to see the maximum detail (time, angle and zoom) where as recreational viewers might prefer a five-minute highlights summary of the event, or of their favorite players. Users could tag video micro-content segments and mix and mash their own fan highlights and instructional videos. Users could share their custom views and select those of others; e.g. ; the defensive coach's view, the Joe Namath view, the Barry Bonds view (e.g. ; how Barry Bonds would customize his view to watch a baseball game), etc. Once all physical-world games are repetitively filmed (think massively multiple YouTube listings), micro-content tagged (e.g. ; accessible at varying layers of detail, for example, all the footage of one specific player) and available in one or more web repositories, the micro-content pieces can be mixed, matched and re-run in simulation. Fantasy league play could explode up to the next level of running game sims mashing footage of how the individual players actually played in concert with their other fantasy league team mates and opponents. Some sort of action reading and mapping would be necessary to make the simulated action make sense. Fantasy league games could be events of their own right and would have their own score outcomes. Status: Need micro-content auto-tagging first, then a mix and match selection and simulation platform with an algorithm to mash physical-world video content of players from many physical-world "source" games into simulated fantasy league games. Another way to mix physical-world content in simulation space would be by having lifelike avatars of the entire NFL, European Soccer League, Women's Volleyball Team, NBA, etc. available for play in metaverse worlds or video games. Players could select to play one, several or a team of avatar athletes to compete against other players playing other avatars. This would be a tremendous licensing opportunity for athletic leagues, including not just the avatorial video resemblance but also possibly a recorded audio database of athletes' umms, ooofs, grrrs and other sound effects. Status: Need athletic leagues to realize that multiverse world player representations could complement and in fact might ultimately supersede physical-world licensing opportunities. Affinity Ratings - New gigg for Digg? Digg's filtering value is eroding now that it has become mainstream. It is time for YAM (yet another mashup) Web 2.0 style - mashing digg and social networking to deliver the ability to see one's social network's diggs, and more broadly to personalize any variety of filters for digg. Maybe some companies will even present this at Web 2.0 Launch Pad this week. Del.icio.us has the same "diluted value due to size" challenge, and is including an early social network tool with "my network," however my network is discrete. A better implementation would be filters overlaying the whole site's functionality, allowing users to filter on all, my networks, me, and any other affinity profiles. Even more useful than mashing up social networks and digg and bookmarking would be adding user-specified Affinity Ratings to digging and tagging. Users could select canned affinity profiles (e.g. ; green, sustainable, entrepreneur-posted/created) or create their own - the "Jane Geek Affinity Rating." The easiest implementation of Affinity Ratings would be aggregating tags. Digg functionality could be expanded to allow personalized affinity ratings on news, and next and more importantly, on non-news items such as products and services. P2P Finance - Does it work? $20 million in loans have been funded to date through P2P lending marketplace darling Prosper, not bad given that the site launched publicly less than nine months ago. But is it working? How are these loans performing? In another victory for transparency (the first being that borrowers willingly consent to having their credit ratings posted publicly), Prosper also makes default statistics publicly available. 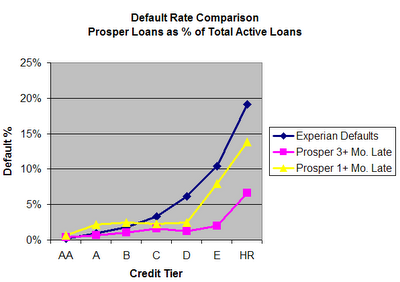 Below is a simple analysis comparing Experian default rates by credit tier to the percentage of Prosper loans that are 1+ months late and 3+ months late on a payment. Although the news appears to be encouraging, since Prosper currently only has 3,372 loans active and billed (below), it is really too early to form definitive conclusions. 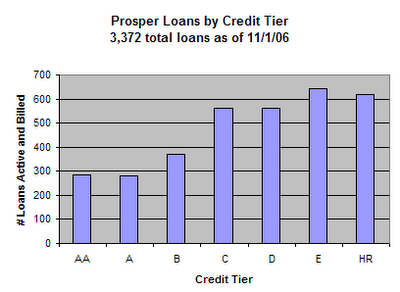 From this early data, Prosper loans seem to outperform traditional loans in the C, D, E and HR credit tiers, but under-perform traditional loans in the higher credit tiers, AA, A and B. Outliers, potentially fraudulent activity and really just too little data and too short of a track record are influencing these numbers, however it will be interesting to see if the trend can be maintained.